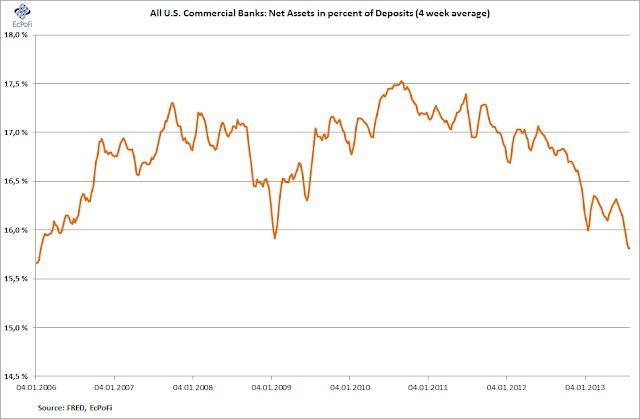 Has the balance sheets of U.S. banks become more solid since the "credit crunch" of 2008? In terms of the Net Assets to Deposit ratio it has not. When viewing the chart below, remember that deposits is a liability for banks. The chart shows that Net Assets (Total Assets minus Total Liabilities) in percent of Deposits for U.S. banks is now at the lowest level since January 2006. The current Net Assets to Deposit ratio tells us that there today is less equity backing deposits than it was pre the credit crunch: on 10 September 2008 the ratio was 17.06%, today it is 15.81% - a drop of 1.24 percentage point or 7.29%.